The connection between estrogen and bone health is well established in the medical literature and well-known in the medical community. Estradiol promotes osteoblast activity, the cells in bone that are responsible for the synthesis and mineralization of bone. During periods of lower estradiol levels such as menopause, the osteoblasts cannot produce bone effectively. This partially explains why osteoporosis diagnoses are increasingly common after menopause, and why oestrogen replacement (HRT) is among the FDA-approved treatments for osteoporosis. Progesterone is a lesser known but equally important hormone in the prevention and treatment of osteoporosis. Bioidentical progesterone therapy has shown promising benefits for bone health in both in vivo and in vitro studies. At a cellular level, progesterone acts on osteoblasts by increasing their differentiation. Estradiol is a necessary part of this process as it stimulates progesterone receptors in osteoblasts. Also important to note is that dosage is important. More is not necessarily better. Physiologic doses of progesterone can increase osteoblast differentiation while supra-physiologic doses suppress this activity. Progesterone impacts bone health throughout a woman’s entire life. Beginning in the teen years, progesterone levels influence bone density: bone formation increases during the luteal phase of the menstrual cycle when progesterone levels are at their highest. Young women with normal progesterone levels and normal ovulatory cycles have been shown to achieve a higher gain in peak bone mass than their counterparts with lower progesterone levels. Observational studies have linked ovulatory cycles with bone mineral density (BMD) increases, and ovulatory disturbances with BMD decreases. One of the most powerful influences on ovulation and progesterone levels in young women is the use of combined hormonal contraceptives (CHC), containing supra-physiologic doses of ethinyl estradiol and progestin, the synthetic (non-bioidentical) form of progesterone. CHCs suppress ovarian function which leads to lower progesterone levels leading to a lower gain in peak bone mass. This process can lead to an increased risk of bone-loss-related fractures later in life. Maintaining normal progesterone levels and ovulatory cycles during the teen years can lead to better bone health throughout life. During perimenopause, women tend to have normal estrogen levels but declining progesterone levels. As a result, bone metabolism changes significantly during this time with increased bone resorption and loss. Women with a lower proportion of ovulatory cycles tend to have more bone loss than those who ovulate more regularly during this time. Is bioidentical progesterone an effective treatment for bone health? Later in life, bioidentical progesterone supplementation can be considered an integral part of the treatment plan for osteoporosis. Among one-hundred patients treated in a clinical setting, progesterone was shown to increase BMD and decrease the chances of fractures in postmenopausal women with osteoporosis. These findings don’t overshadow the fact that estradiol has been more extensively studied in the treatment of osteoporosis, as these two hormones can be combined for a more comprehensive treatment approach. Choosing the right delivery method and formulation are critical as combined topical bioidentical progesterone and estradiol has been shown to create the most significant increase in BMD when compared to non-bioidentical oral combined hormone therapy and controls. Prior JC. Progesterone for the prevention and treatment of osteoporosis in women. Climacteric (2018); 21(4): 366-374. Prior JC. How can we protect peak bone mass and future health for adolescent women? -By supporting ovulation and avoiding combined hormonal contraception use. Rev Paul Pediatr (2017); 35(2): 121-124.
von Mach-Szczypiński J, Stanosz S, Kościuszkiewicz J, Safranow K. New aspects of postmenopausal osteoporosis treatment with micronized estradiol and progesterone. Ginekol Pol (2016); 87(11):739-744. Seifert-Klauss, Schmidmayr M, Hobmaier E, Wimmer T. Progesterone and bone: a closer link than previously realized. Climacteric (2012); 15 (Suppl 1): 26-31. Schmidmayr M, Magdolen U, Tubel J, Kiechle M, Gurgkart R, Seifert-Klauss V. Progesterone enhances differentiation of primary human osteoblasts in long-term cultures. The influence of concentration and cyclicity of progesterone on proliferation and differentiation of human osteoblasts in vitro. Geburtshilfe Frauenheilk (2008); 68: 722–8. Lee JR. Is natural progesterone the missing link in osteoporosis prevention and treatment? Medical Hypotheses (1991); 35: 316-318. Depending on your hormone balance osteoporosis and osteopenia can best be treated either with progesterone alone or a combined cream with both progesterone and oestrogen. 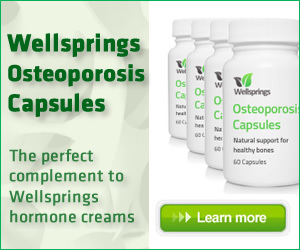 A specific supplement such as Wellsprings Osteoporosis Capsules will provides the other essential bone building elements that are most effective used with a bioidentical hormone cream.